In twentieth-century fine art the color black gained a prestigious position. The phenomenon is hardly independent of the artistic event proclaimed by Malevich, the totalizing of the demand for reduction, and it is, naturally, not independent of the Shoah. 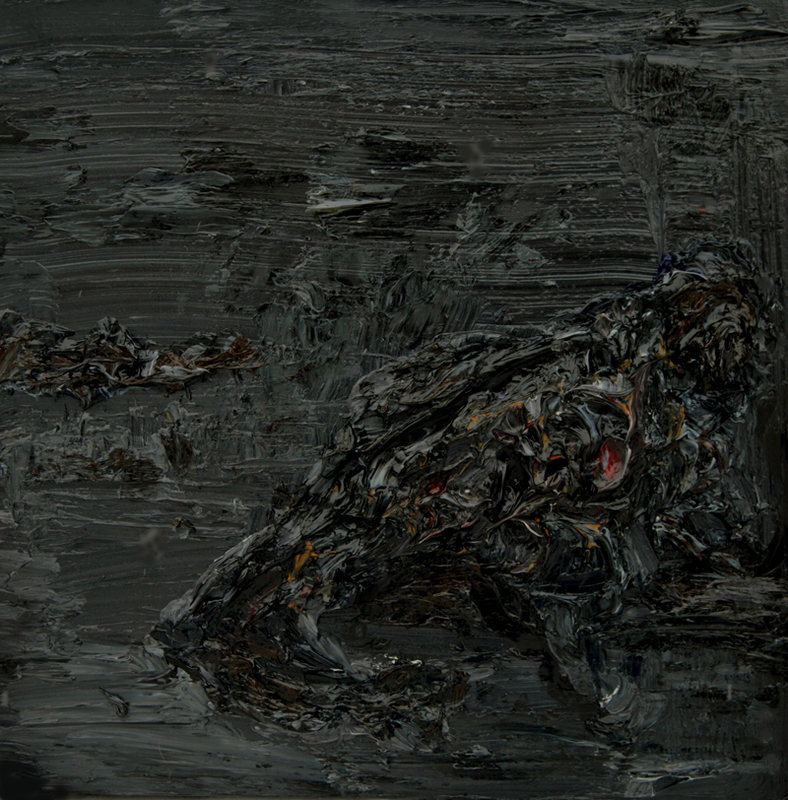 According to Adorno, after Auschwitz there can be no creditable painting without the tones of blackness. As he asserts, “the ideal of black” (Ideal der Schwärze) in fine art was created as a response to the “Black holes” and the massacres of Auschwitz and has been being continually created since 1945: “Radical art is today synonymous with dark art; its primary color is black. […] Along with the impoverishment of means entailed by the ideal of blackness—if not by every sort of aesthetic Sachlichkeit—what is written, painted, and composed is also impoverished; the most advanced arts push this impoverishment to the brink of silence.” Nevertheless, there are few artists who wish to represent the world exclusively through this single color, that is, artists who insist on using only black throughout their life, in their entire artistic universe. Adorno’s opinion about this lack of reflection is no less radical: he claims that the lot of contemporary artists disqualify themselves by not taking into account such a tragic necessity of black, by playing with colors with childlike abandon instead. 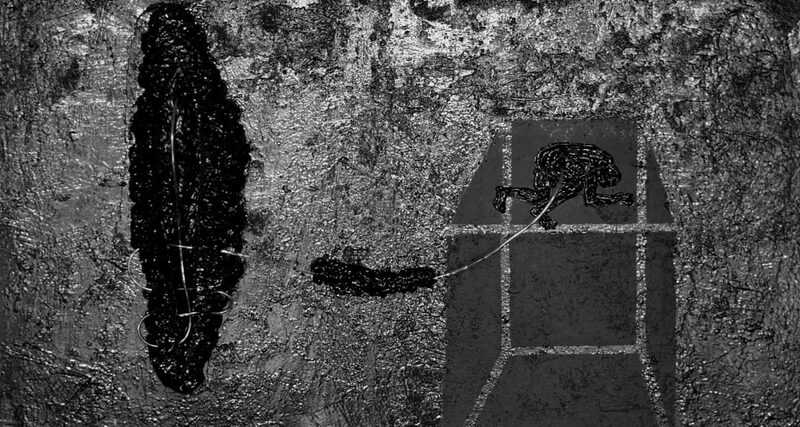 Black takes central stage in Zsolt Berszán’s art. He did not arrive at this color immediately: he had to travel to it through an entity that is tied to the black earth and mortality. In Berszán’s early period blackness appeared through a formal element, the motif of the worm; in his second period the motif was consummated: it was transfigured into the idea of blackness as a totality encompassing the entire universe. Berszán’s artistic journey leads from the representation of the human being disjointed into a set of organs to the creation of the “worm universe” as object and image. 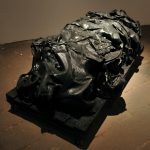 In his Autopsy series (2005), one may already recognize materials that become dominant in his more recent work such as polyurethane foam and silicone as well as the use of metalized black paint. 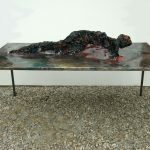 These works put the decomposing human body in their center: one of these, for example, represents a human body spread out, with limbs that are almost throbbing with life. One can almost feel the blood pumping through the veins that spread through the flesh. [1. Autopsy 3, 2005] Nevertheless, this body is already covered by darkness. The black stains painted on the body seem like empty spaces from which life has been carved out: dying is written on this hardly discernible figure as the degradation of material existence and the lack thereof, as the imprint of nothingness. Another picture takes a step further and shows a body with its skeleton fallen apart: one can only identify the separate bones lying around and the various organs which—quite grotesquely—appear like beads of a pearl necklace that has fallen to pieces. These human remains do not refer back to life any more. They have already been washed into the ground, which preserves organic materials until the rulers of this underworld existence, the worms eat it away. 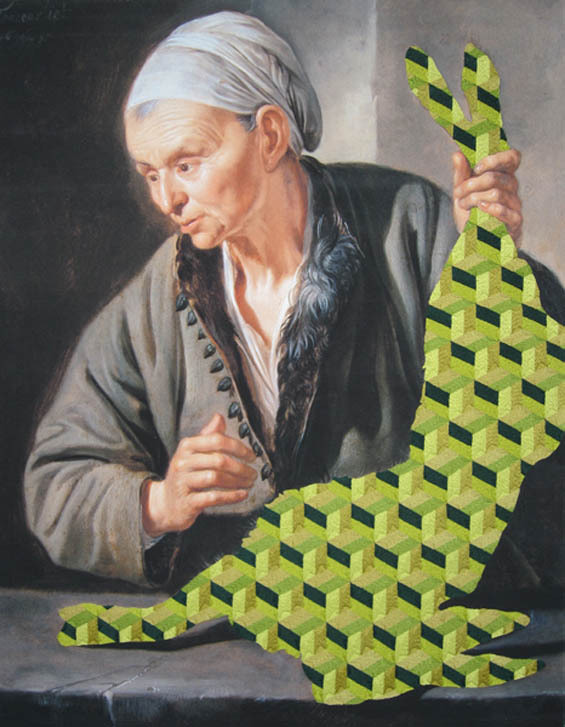 Berszán started producing these black pieces in 2007. From this time on he seems to be committed to black as one of the dominant colors to represent the world. 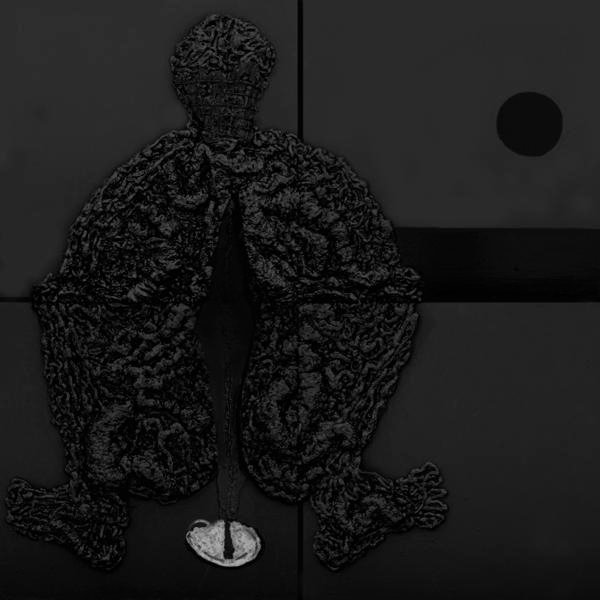 Most of the pieces made in 2007 and 2008 still show human body parts that represent impermanence and decay in one way or another: these are the Black Body series, Black Fluid Transfusion and Black Head. 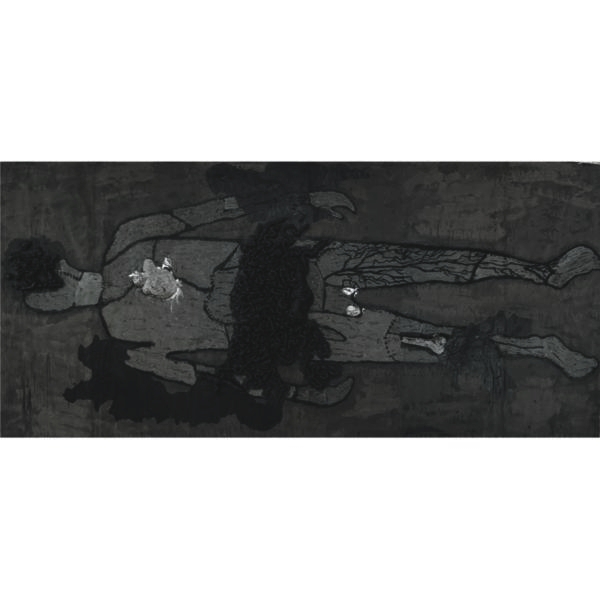 Black Fluid Transfusion displays a crouching human form in a black space incised by bars. He is connected to a dark hollow, from which a long tube leads into his intestines as if he were receiving blood transfusion or some other nourishment for life impossible to receive in any other way. [2. Black Fluid Transfusion, 2008] The dark hollow opens up as an orifice in a space of coarser textures that seems to stand for some other quality of existence: perhaps serving as a gateway to another world. This hollow can also be interpreted as a wound, although some of its qualities already hint at the form of the worm. This work already indicates that human beings receive their life-force from a “dark force,” from a parasite responsible for decomposition and decay. In the board Black Head, prepared on a metal plate, the aforementioned space, sliced up by bars and imprisoning the human being, becomes a zigzag, yet it appears continuous and homogeneous: empty and dead. [3. 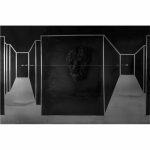 Black Head, 2008] This space is dominated by a skull, the visual symbol of human rationality. There are two wires attached to the skull, leading horizontally in both directions, encompassing and owning the black space, , but the two outer ends of the wire are fixed. The work testifies to the fact that the human mind, which may seem to rule over the world and create a knowable universe for itself, is, nevertheless, a prisoner of its own vision. 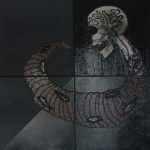 In the Black Relief series, the worm itself enters as a strange, provocative creature that “laughs man in the face.” This piece, which dates back to 2007, represents the worm in a way that still maintains anthropomorphic character traits. This is why one may consider it a merely provocative design. [4. Black Relief 1, 2008] Here the worm has a human skull, it is not an independent organism, but rather halfway between human existence and worm existence. Man is provoked by the thought of the worm but as long as this being is represented as an in-between, as a transition which is still marked by humanist ideas, one may be able to keep an ironic distance from this creature symbolizing decay. But when the homely feeling of human existence is gone, when the ideas supporting self-respect and dignity disappear, when the only thing one faces is the faceless inhuman silence of decay, this world, which seemed so stable, suddenly vanishes. In its place one can only see a hollow, an abyss, a chasm yawning with an unknown life form that feeds on the energies of decomposition, the horrifying otherness of another existence. The Black Relief series does not lead one this far: the “yawning worm” does not want to eat up and destroy us: rather, it is only grinning at us peacefully. But what kind of relationship is there between the human being and the parasite feeding on him? Well, according to the explicit references of the works, the crouching human figure is just having a bowel movement. [5. Black Relief 2, 2008] The faeces coming out between the open legs, which, as we know, is an excellent nourishment for parasites, cuts the human figure into two. The simplified black form appearing right at the vertical axis of this figure is soon becoming the most privileged symbol in Berszán’s art. In this visual narrative, the form of the worm that appears in the splitting human being becomes an analogue of Paracelus’s “inner alchemist,” the one responsible for the processes of nutrition and digestion, reception and casting out. 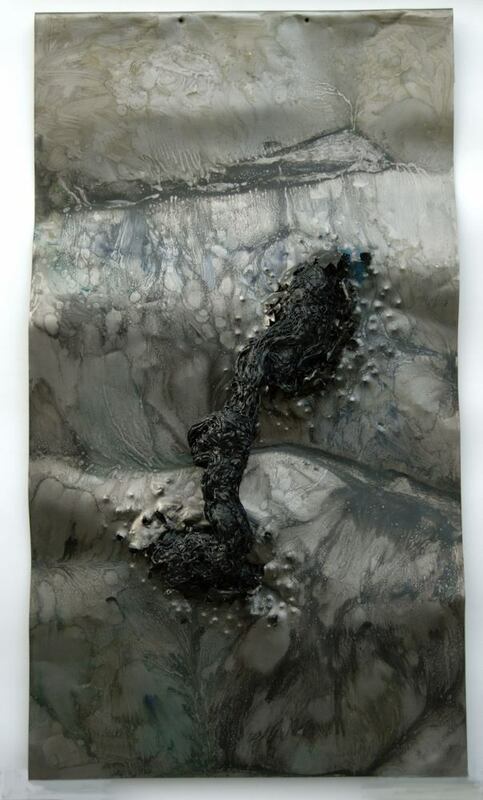 There is another piece of the Black Relief series that is exhibited together with the pieces of Genesis Project as a prototype. [6. 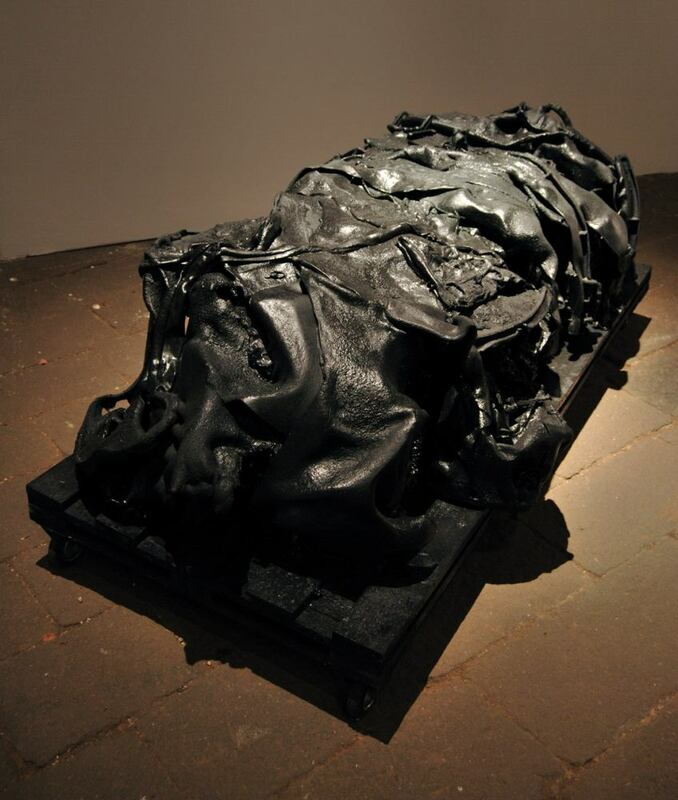 Black Relief 3, 2008] In this “relief” made of foam and black silicone, one may perceive another crouching human figure in the act of disburdening himself of the inevitable results of chemical secretion. There is a halo over his head—an ironic sign in this context, without doubt. For Berszán the human being is far from a being of divine origin surrounded by the aura of spirituality: he is much more characterized by his awareness of his finitude and his vulnerability to the material world. It is not the light of the spirit that surrounds him: he is smeared all over with his own excrement. The thick bands of solidified polyurethane foam, squeezed out of the can with violence and real physical force, draw a human form of twisting fibers, flesh, sinews, and bowels, while the thinner brands of silicone run through them like networks of blood-vessels. Within the skull which seems to open up before our eyes to satisfy our curiosity one may also perceive layers of silicone brands, which evoke the image of twisting worms, maggots, and larvae. The whole body is painted black as if it were covered by excrement. If one steps a little closer one may realize that the halo over the figure’s head is a colorless rubber tube with black water “gurgling” inside. This rubber tube halo, which symbolizes the connection with the beyond, continues within the body, following the line of the spine and guides the spectator’s eye downwards, towards the ground. 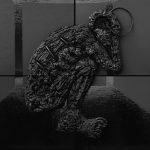 In Berszán’s world the human being in no longer a mixture of the sacred and the profane: he is irremediably connected to mud, decay, and residue. He is a marginal creature, chained to the earth. 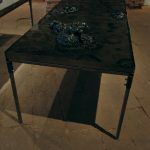 Berszán’s first large-scale art project, presented in 2010 in Modem in the exhibition Genesis Project, allows one to enter the world of a microorganism that has always been an integral part of organic human existence but has always been disregarded and disavowed. The central figure of the artistic world of Berszán is not the human being but the highly symbolic figure of the worm. The human microcosm is exchanged for the non-anthropomorphic, faceless world of the worm, for a universe that is alien to us, a universe that causes anxiety with its darkness and unfamiliarity. Thus, what one witnesses here is not so much a human being that has fallen into pieces, organs, cells, and atoms, but rather the micro-world of alien organisms that live invisibly in the dark recesses of our own body. These are worlds that make the non-human qualities of existence visible. The human being gets displaced, outside the humanist worldview that defined him as the crown of creation, as the being superior to all others on the ladder of existence. Within this contemporary artistic project the worm is not simply a symbol but an immediate presence, whose offensive and revolting quality is represented in a most physical and graphic way. It is defined as the opposite of what is human. Often even imagining the worm leads to repulsion, since it fundamentally undermines one’s belief in life: it eats away what is organic, what is alive. What is more, this invincible “enemy” lives within ourselves: it feasts on the source of life in the invisible darkness on the body. As Nietzsche asserts in his “David Strauss: The Confessor and the Writer,” “[a] corpse is a pleasant thought for a worm and a worm is a dreadful thought for every living creature.” The idea of the worm fundamentally undermines the old view according to which an “eternal” spiritual principle may safeguard against our bodily defenselessness. Berszán’s works reveal the aspect of the worm. It is not simply an aspect of existence that lacks human beings but an inhuman, godless one. 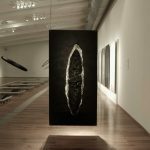 As we pass through the narrowing corridor and enter the well-segmented space of the exhibition, we face an aluminum board painted black hanging in front of us. From the board a worm is looking back at us. But we do not turn back: we are made curious and become more and more fascinated by this world that seems so repulsive at first sight with its strange laws and unfamiliar order: one is gradually engulfed by the blackness. It is as if this darkness opened a secret gateway to experiencing horror, the unthinkable. The process through which humanity reshaped the world and made it anthropomorphic took thousands of years. The intimate connection between the macrocosm, that is, the universe, and the microcosm of humans probably already existed in ancient civilizations; it was certainly important for the Greeks. The Bible also knows mentions the analogy between the macrocosm and the microcosm, but in Christianity man is not the source of the macrocosm but its “product” and “goal.” God created man in his own image and the world for his “use.” The analogy between the Creator and its Creation becomes especially significant in the Christian concept of the Church, since the Church is seen as the body of Christ through which the son of God became man; and the head of the Church, as we know well, is Jesus Christ himself. In Western (ancient Greek and Roman then Christian) civilization the analogy between the macro- and microcosm has inevitably led to the anthropomorphic view which still heavily influences our thinking. The sixteenth-century polymath Paracelsus believed that humanity cannot be understood independently in itself but only in its organic unity with nature. His new medical methods aimed at creating harmony between the traditional theological view and natural science; consequently, he claimed that health and illness are both the manifestations of the harmony (or disharmony) between man (the microcosm) and nature (the macrocosm). His “philosophy” was strongly influenced by the Greek humanist view, which puts the human being in the center and believes that one can only understand the phenomena of the world (the macrocosm) through the understanding of man (the microcosm), and vice versa. Accordingly, he explored the human body as a microcosm that represents the phenomena and workings of the macrocosm. He turned towards the chemistry of the body: he saw illnesses not as the signs of the impurity of the soul but as results of the temporary loss of balance of minerals within the body. His basic standpoint was that everything that one eats contains poisons that are harmless to themselves but may become potentially dangerous to the consumer. It is the job of an “inner alchemist” to care about the secretion, discharge, and transformation of these. This “inner alchemist” is the human body itself, the intestines, the various organs and bodily fluids: the inner microworld that mirrors the leveling mechanisms of the big whole, the macrocosm. Today it is common knowledge that this “inner alchemist” has deadly enemies, ones that it even has to coexist with: the body is a host of not only repulsive worms and parasites that feed on it (and sometimes overcome it) but also of other micro-organisms such as bacteria and viruses. Therefore, it may very well happen that this “inner alchemist” cannot create its own microcosm, and its attempt to create an inner harmony fails. At the time of Paracelsus, during the renaissance of classical ideals, when the humanist worldview with its analogies between the macro- and microcosms flourished, one could not face the inner organisms that fundamentally influence the inner life of human beings. Can one face this inner world today? Is it possible to come face to face? Not only with other species or another microorganism but with a different possibility of life, with another quality, with another possible order of the universe, with another Genesis? Is it possible to face the possibility of an existence that is not based on the idea of a meaningful, spiritual universe but on a fiction of the impermanence of everything material, the continuous recycling of life from decomposed matter? Can one face the horror of “worm existence” which initializes another genesis, one in which there is nothing human or at least man is no longer a repository of being? The “worm universe” is not simply the opposite of the human micro-world, it is something much more terrifying. The “worm universe” contests the view of the universe as a harmonious, spiritualized macrocosm: it is the opposite of the divine. This is the universe that Berszán’s project of contemporary art invites the viewer to. The development of natural sciences and their minute investigations allow one to see deeper and deeper into the world of various micro-organisms, but the discourse of science impedes one to conceive the world as an organic whole. It also seems impossible for us not to look at the world as a human universe but a universe of other life forms, a space of radical otherness. The only aspect the paradigm of science is able to offer is the human one. The gaze of the scientist is still necessarily a human one, which can only perceive a human world. No matter how close we get to other life forms, to the increasingly detailed and precisely reconstructed microscopic worlds, we can still only see the reflections of the human mind in everything and always. The image of the world that one gazes back at us is still an anthropomorphic one and not only because the human eye stands at its focus: apparently it is a basic interest of the human being to perceive oneself at the top of the hierarchy of beings and to keep the world discovered by science a homely and knowable one. The idea of knowledge, its acquisition and its rationality, seem like means of “conquering” the world: ways of making it measurable and describable and, therefore, easy to possess and rule over. But this is not really facing something: that is not wished for at all. It is not the kind of “long, open confrontation” that one can read about in János Pilinszky’s poem “Definition.” In Berszán’s works, standing face to face with something other, something different does not involve the submission of the other to human scientific rationality: it is a radically different approach. 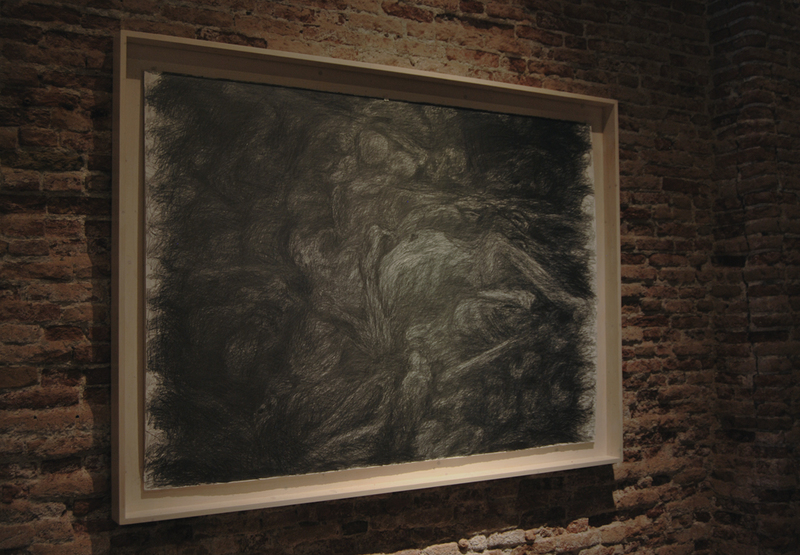 Berszán’s works are painted completely black. The concrete, the polyurethane foam, the silicone: they are all black. When entering the world of Genesis Project one might feel like arriving in the Black Country of the Hungarian poet Babits Mihály, where “everything is black, but not only outside / black to the bone, to the marrow.” But the “black country” of Genesis Project does not only point out the blackness of the heart of the Earth: the artistic gesture of painting the whole world black also poses a question about the meaning of blackness. In Berszán’s work the reduction of colors to black is foremost a question of painting, even though his art does not involve painting in the traditional sense. Several pieces of the project hang on walls as if they were paintings but they also resemble reliefs. 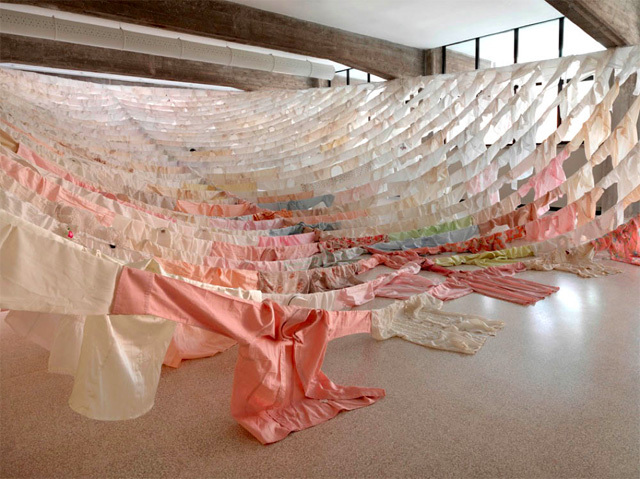 Seven of the pieces serve as “reclining panel paintings” laid on pegs on the floor. 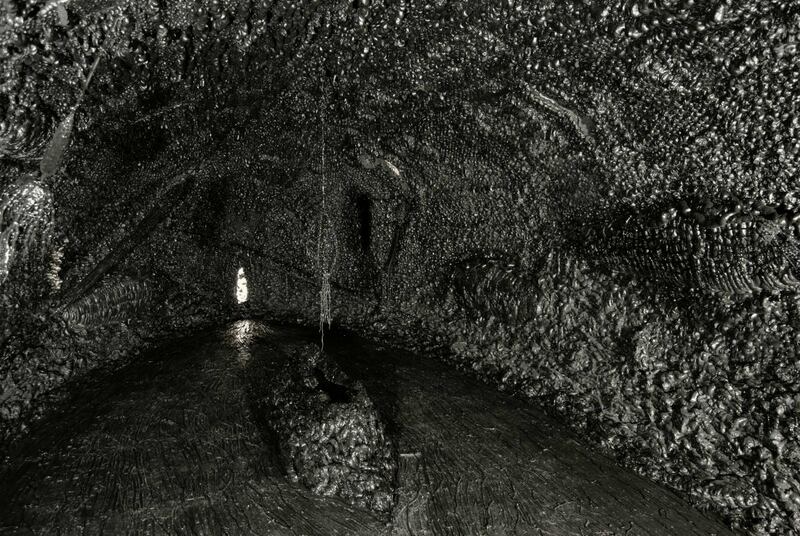 These trough-like objects were filled with water, but even the surface of the water appears glistening black due to the layer of leveled pitch underneath. Some of these installations are hanging in the air, from metallic wires or invisible nylon fishing lines. The works are either all siliconepainted black or made of black silicone, which substitutes for the paint. Only the metallic color of aluminum remains a counterpoint sometimes, emphasizing its materiality. 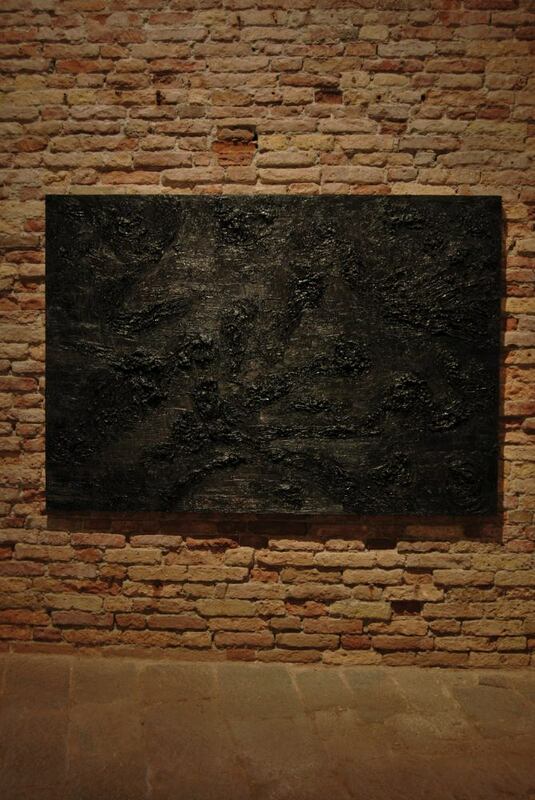 It is not only the fact that Berszán also used to work as a painter that legitimizes a pictorial approach to his use of black but more importantly, the “picturesque” quality that is so characteristic of the surface of these pieces. 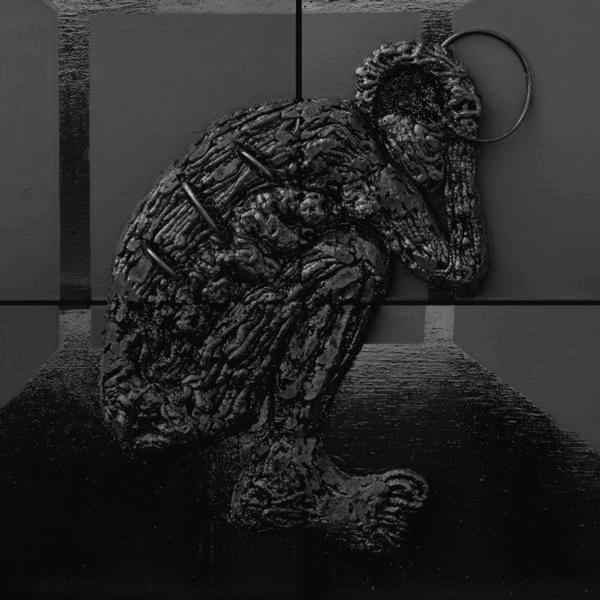 The works of art within the Genesis Project reflect on one of the most exciting problems of modern art through the practice of painting over but also through the use of black silicone, the brands of which strongly resemble bands of black distemper squeezed out of the tube, thus creating an analogy between the two materials. The blackness on the surface of these works can only be properly understood within the context of twentieth-century painting: as it is well-known, the beginning of the last century witnessed the return to black as part of a wish to return to one of the most fundamental colors of our world. Berszán reformulates the problem of “black painting” established after the turn of Malevichian reduction. In Malevich’s first black painting (Black Square on White, 1913), the abstract nature of objectlessness coincided with the reduction of color. The basis of this was supported by the theory of economism, according to which there are three stages in the hierarchy of colors: black, colored (that is, red), and white. Black stands for that point of origin through which the finitude and extremity of the world are expressed. Red is broadly speaking the color of intellectual revolution while white, the color in which all colors are dissolved, symbolizes infinity and the lightness of the immaterial world. [7. 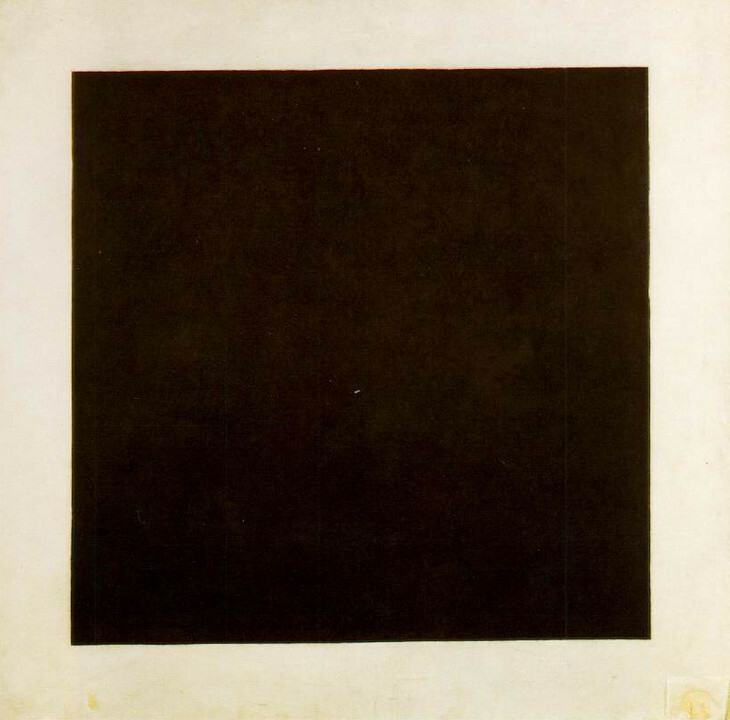 Kazimir Malevich, Black Square, 1915] In Black Square, the black square is painted on a white background. Nevertheless, one does not really perceive this background or base, one usually identifies the thin white edge only as a kind of frame that is lost in the spectacle, which effect makes the whole canvas seem totally black. The theory of the economy of colors was reformulated by several influential artists in the twentieth century, and they used it with altered symbolic significance. Robert Rauschenberg painted his black, white, and red canvases in 1951 and 1952; all three are of the same size, the colors were put on the canvas together with objects found in the street and painted elements. He called this pictorial style, based on the technique of collage, “combined” (combine) painting. The pieces of his black series are integral parts of a wider artistic endeavor. In the early 1950s in North America, for the painters of the abstract expressionist school and the New York school, it was almost obligatory to paint black paintings. Since black could represent both mystery and transcendence, it was considered something of a “sacred color” or the “philosopher’s stone.” There were artists who did not consider the artistic understanding of blackness simply as an experiment but devoted whole series to the project. Apart from Robert Rauschenberg, it is also worth mentioning Ad Reinhardt, Mark Rothko, and Frank Stella. The Haus der Kunst of Munich organized an exhibition in 2006 which collected the most significant pieces of this trend. This exhibition showing their black series from the 1950s together revealed clearly that this kind of reduction to one of the most “absurd” of colors does not close or limit art but opens it up: it leads to numerous meanings of blackness and creates various new possibilities of understanding the world through this color. I have called black one of the most absurd of colors. Since black, together with white, cannot even be called a proper color, at least not in the optical sense. Black is an exceptional case in the theory of color, too: it does not strictly speaking belong to the set of “normal” colors and both its physical and psychological perceptions differ from those of ordinary colors. As it is well known, all the various shades that one perceives go back to three basic colors. The human eye is physiologically programmed to receive the three basic colors, that is, rays of light of three different wavelengths reflected back by colorful objects so all the shades that one sees are results of simultaneous perceptions of these three colors mixed. This physical and physiological background of visual perception was discovered by Herman von Helmholz, a nineteenth-century optician and physiologist. From this point of view, black just like white, cannot be considered to be colors since they do not have their proper wavelengths and also there is no corresponding receptor in the human eye: their perception is a result of the summation, subtraction, or lack of three different reflecting light rays with three different wavelengths. One sees black when the three wavelengths are reflected back to the same degree and their sum does not exceed ten percent. This quantity is, however, so low that one has to regard the perception of black as a kind of lack: the lack of light and stimuli. Interestingly, painting, the art form that relies so fundamentally on colors, can represent this state of lack as infinite richness. Rauschenberg’s paintings of concentrated blackness are shocking. The panels that are smeared with sticky black mass appear like reliefs, yet they also retain the marks of the brush, the dynamics strokes in an expressive way. [8. Robert Rauschneberg: Untitled, ca. 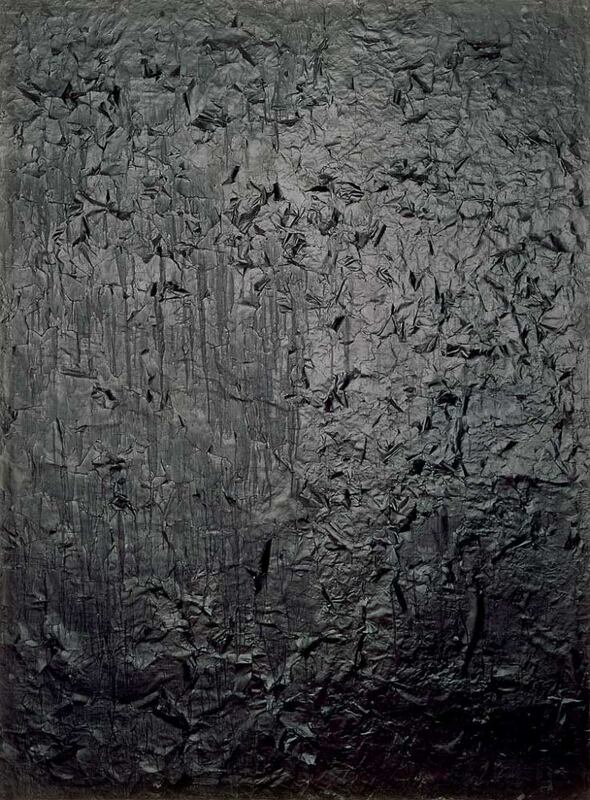 1951] This impression of a relief-like surface is created on the one hand by the mass made of asphalt and gravel and on the other by the pieces of wrinkled and torn wastepaper applied to the canvas. Rauschenberg believed that “a painting is more real if it is made of the pieces of the real world.” In a way, this artistic endeavor continues in peculiar ways in Berszán’s use of industrial materials, though he does not use these so much as a sculptor but rather as means of creating a specific universe of object-images. When he uses his materials against their intended purpose and context and places them in a world of painting and sculpture (combined painting), literally building his worlds from these displaced materials, this is certainly the manifestation of Rauschenberg’s artistic ideas. Of the artists exhibited in Munich, Ad Reinhardt can be called the par excellence black painter. Putting the color black on the pedestal is much more than a short digression for him: it is a coherent artistic program. 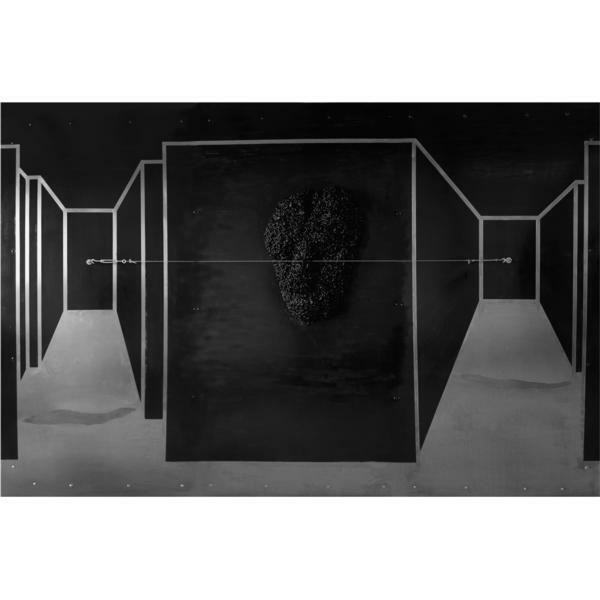 From the 1950s on Reinhardt only made black paintings and also wrote theoretical treatises on black. In these writings, he consistently rejects all the basic formal and thematic characteristic traits of traditional painting. He demands painting to refuse to employ straight lines, composition, form, brush marks, texture; there should be no more colors, not even white, no more perspectives, foreground or background, movement or time; no more themes, symbols, no emotions represented, and the picture should be neither accidental nor planned. The only thing that may remain is a plain surface and the color black. Luckily, black has many shades and Reinhardt wanted to try all of them so he placed various colors in transparent layers on the canvas so that it would show how changing the shades of colors may result in a multiplicity of shades, how different blacks influence each other, and how even the smallest change in shade can result in the change of the proportions of the motifs. Reinhardt arrived at the idea of black painting in an intellectual way, pursuing the idea of terminating painting. Paradoxically this resulted in an art form that was infinitely painterly. Berszán’s works also display a great richness of shades but in a completely different way than in Reinhardt. In his art, the differences in shade signify border lines, divisions into forms and motifs. Nonetheless, the figurative quality of these works is not achieved through the differences in color, or through drawing lines, but through using different materials of different qualities and sensing the layering of various materials on each other. In his art the network of lines created by the bands of foam and silicone exceed the two dimensions of painting: it protrudes from the surface, creating a three-dimensional image. The way the effects of shadows cast by these three-dimensional “paintings” is also significant: the composition consciously involves the shadows of emerging shapes on the flat surfaces. Such an appearance of shadows on black surfaces further strengthens the anxiety caused by the motifs of worms. 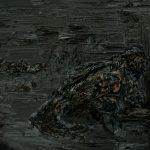 The contemplation of Mark Rhotko’s black paintings evokes this kind of feeling of fear and anxiety, though his works achieve the effect through different means. Rothko’s paintings reveal the transcendental qualities encoded in blackness. His monochrome works look like objects calling for meditation, manifestations of a spiritual universe. The striped, almost decorative paintings of the fourth artist exhibited in Munich, Frank Stella, show fewer characteristics in common with Berszán’s work than the previous ones, although the significance of lines scratched into the aluminum surfaces of the Genesis Project definitely connects the two. Stella drew lots of parallel white lines on the black background (by hand without a ruler), and the rhythm of these lines, the inward or outward “flow,” creates an effect of spatiality. Berszán scratches the lines into metal plates which lend them a silvery shine, yet they are reminiscent of Stella’s surfaces. Arnulf Rainer, who painted almost monochrome black pictures in the 1950s and 1960s, did not belong to the above mentioned American group of artists, so his works were not exhibited in Munich. 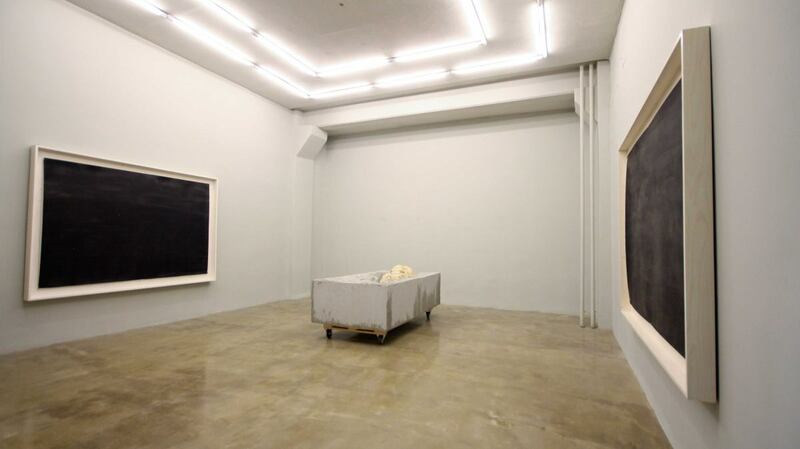 These works were only almost monochrome because Rainer did not paint the whole canvas black but left one corner empty. This was supposed to communicate that these were not intended to be black paintings, he only painted over something else, something already painted, übermalt, as he called it. Reiner also ironically commented that his painting-over, Übermalung, resulted from his high aesthetic standards: this was a way of concealing the faulty, weak spots of his works; he painted over them again and again until the whole painting would almost disappear. 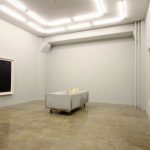 Of course, there is no such thing as painting over mistakes at Berszán, though he also makes things disappear: first of all the raw, light color of the polyurethane foam. Nevertheless, sometimes he keeps the original colors of materials, mostly the silver of aluminum in order to explore the differences between black and various material qualities. Black and silver create a metallic, hard quality together, especially since the black surfaces and the bands of silicone are also shiny. These together create the impression of an unshakable, artistically elaborated world. Silver is the color of metal: this metallic glittering stands for a unique quality in Berszán. It appears as if the specific quality that one associates with silver, while looking at it, did not exist independently (as a color) but were trapped within the precious metal that carries it. The special visual effect of silver comes from a certain effect of light and it is also worth mentioning that silver can only reflect light from a plastic surface and even that only if there is appropriate light. Without light silver becomes gray and loses its preciousness. But what is the color gray like? In the “visual grammar” of painting gray stands for the most neutral color which nevertheless is connected to the two extremes, black and white. It can technically be seen as one shade of black, or to be more precise, an infinite variety of its shades. It was Gerhard Richter who revealed “the true face” of gray—the artist who is also referred to as the painter who continued the tradition of black painting. In the oeuvre of the German artist, gray is the basic color. From the late sixties he painted several gray series (the Gray Layers series, series of sea and clouds), in which he was mostly interested in the technique of layering colors, the elaboration of color, and the thickness of the layers of paint. Later, in his series of paintings about realist photographs, gray started functioning as a “non-colour”, as a means of manifesting the impossibility of differentiation. As he put it: gray is the visual expression of indifference, the negation of expression, and the lack of opinion. In his 2002 series exhibited at the Guggenheim Museum in Berlin, he made an interesting experiment with gray. He placed eight enormous boards with windows on them next to each other on the wall. The eight boards were painted gray, but were made from glass (the robust material was fixed by metallic frames), and the shiny surfaces of the glass reflected light and everything in its vicinity. Because of the shiny surface, gray (even though being flat gray paint) gained depth and seemed darker than it was, almost black. 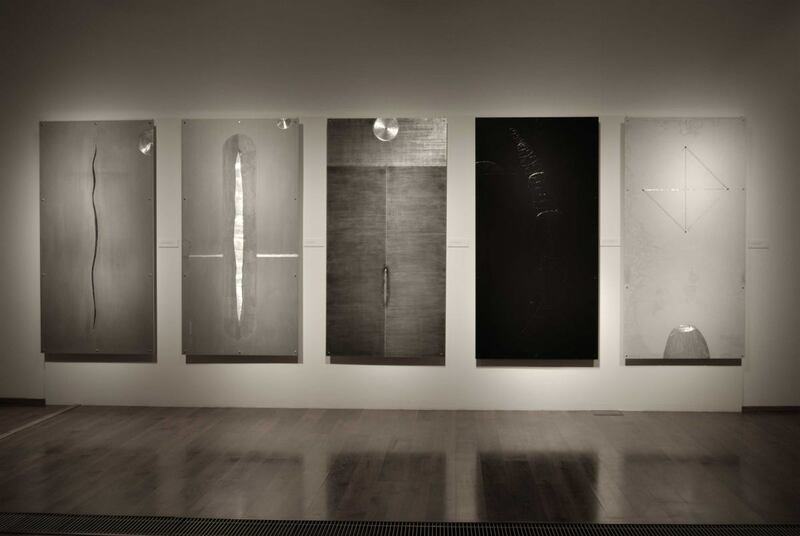 Richter had been interested in the problems of reflection and the play of shadow and light previously; he had created a glass series in 1967 and another one in 1977. These were also painted gray and were kept together by a metallic frame but these were three dimensional so one could also walk around them. 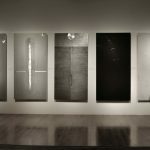 These three glass series put strong emphasis on reflection and mirroring through a complex exploring of the meaning of gray. Berszán’s works are intimately connected to this intellectual milieu of Richter’s glass pieces. What interests Berszán in black most of all is its relation to light: the role played by light, reflections, and shadow. The visual perception of black is connected to the lack of light, and the color’s psychological impact is probably related to this physiological phenomenon: that we experience it as a dark, demiurgic force causing fear and anxiety. But Berszán places layers on his painted surfaces or creates such unpainted surfaces which support the reflection of light and through this he manages to include the appearance of light in compositions that investigate seeing the lack of light. In places where he does not use glistening silicone because he needs the smoothness of the surface, he applies oil paint and then places a layer of lacquer on top of it. There are other surfaces that do not simply reflect light but work almost like mirrors, reflecting back light and the surroundings. Nevertheless, they never become true mirrors: the world one may see on their surfaces is blurred, its proportions are distorted. To a certain extent even the surface of the glistering aluminum board can reflect light, just like the colorless shiny surface of unpainted plexiglass. But the water in the trough works may create an almost “real” mirror. Under the surface of the water there lies a leveled layer of pitch that creates a background dark enough for the transparent shiny surface of water to maintain an image, a mirrored representation of our world. When one looks into these pieces using water, one may perceive two different worlds. One of these is black: an uneven form made of silicone protrudes from the bright, even surface, a piece of the worm-object. 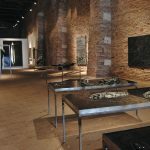 The other world is also black: this includes the spectator and everything that surrounds one at the exhibition, the light fixtures, the walls, the other works of art. These two worlds make up that art(ificial) world which is made possible by the work of art but can only be born in the spectator’s mind through the act of looking. In this art-world everything is rootless: what we see is a transparent surface that starts rippling as soon as our foot accidentally touches the edge of the trough. On the surface of the water everything is a simulacrum, nothing is real, except for the body of the silicone worm and its remnants that we experience as three-dimensional reality. As one may see in Berszán’s basic artistic endeavor, black is much more than a strictly pictorial question; however, it cannot be fully understood without the aforementioned artistic pursuits. The exhibition entitled Back to Black (Bonn, 2008) gave an excellent overview of the way the reduction to black lives on in contemporary painting. But Berszán is not a painter. Even though the reduction of colors to black is first and foremost a pictorial problem for him, it is not merely that, as it comes with a radical change in the materials used. The blackness of the world of the Genesis Project cannot be understood without comprehending the significance of these materials, without the robust quality of the installations and physical objects that create the feeling of strength, weight, and burden. Berszán’s works are spatial objects but not sculptures; they never stop referring back to the two-dimensional plane of images that they have broken out of, the plane that they actually problematize. A rectangular board hanging on and flush with a wall evokes the concept of a painting even if it has a three-dimensional surface, if it steps out into space, if it is relief-like. It does that even if the board is lying on the floor, if it has two sides or if it is hanging from the ceiling. These works resemble the plane panel of a painting so it may be better to call them images that have turned into objects, object-images, rather than sculptures. But what we have here is not installation art either. 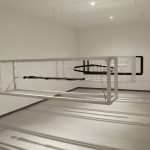 Although Berszán often installs objects in space, these works do not attempt to step out of the “ideal world of art” into the surrounding “real,” social space similarly to art installations. On the contrary: one can feel the aura of aestheticism around these works, it can be felt in the strength of the masterpieces, and there is apparently a strong belief in the authenticity of art. 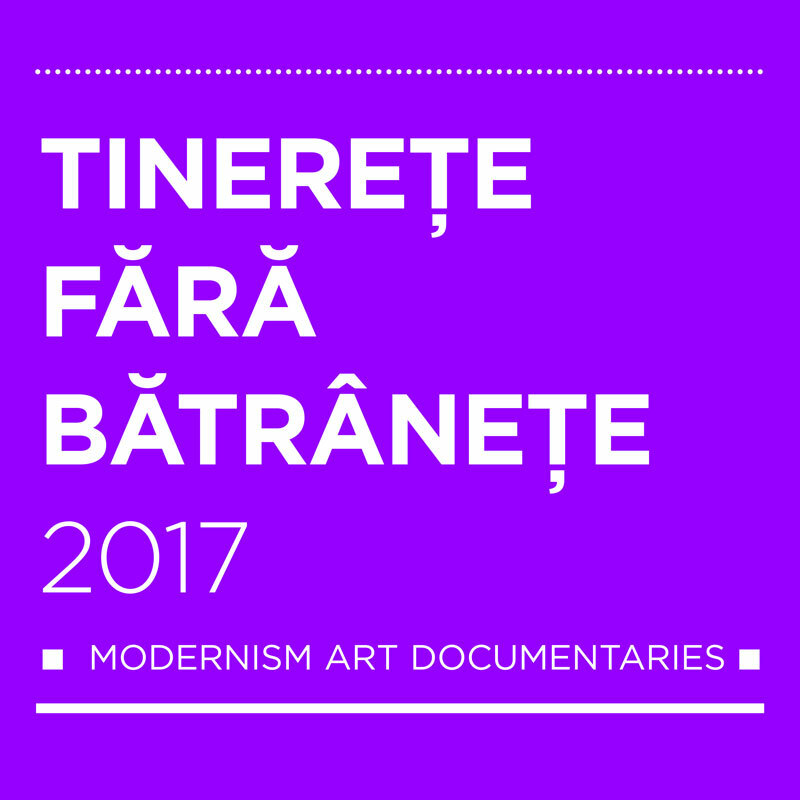 Berszán exceeds traditional artistic forms not as a result of questioning art but because of the aim to broaden art’s limits and to find new ways for it. But besides the quality of the aesthetic, which is an adjective usually used in the context of classical works of art, there is another quality present here, energy. The artist is not afraid of putting heavy weight on his works: they are robust, dark, and dramatic. Actually, it is precisely this strength that he is looking for. The principle of composition is clearly discernible in these works: they are well-composed and carefully shaped. Berszán uses industrial materials just like classic minimal art sculptors (Sol leWitt, Donald Judd, Anthony Caro), only he does not apply them in their raw form, without any intervention, but he shapes, forms, paints, and works the surfaces. When he cuts a split in the iron plate, he also makes the line three-dimensional, spatializing it. When he lets the form made of layers of silicone break out of the surface of the work, he spatializes the motif. Also, there is another factor that one needs to consider, and that is the real, physical energy involved in the body working the surface of the material or the impact of the industrial equipment—the concrete mixer, the angle grinder, the welder, etc.—added to the human force. Berszán works on the surfaces and thinks like a painter, but also steps out of the virtual reality of painting. He does this in order to create an effect of some sort of energy in the project, some kind of a surplus that carries and endures weight. So as to achieve this, he has to, so to speak, “throw the brush and the canvas on the rubbish heap.” He must work with metal, concrete, pitch, and other industrial materials. Polyurethane foam is usually used as a material for insulation of buildings, it is easy to use and solidifies quickly. On the surface of the work it has a completely different function: it has an interesting texture, it is light but at the same time hard, and it creates particular, inimitable forms on the surface. The foam coming from the can makes it possible to create thick, strong, yet roundish, “three-dimensional lines,” the kind that would hardly be attainable through any other material. 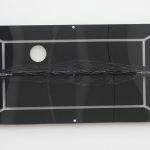 In addition to the foam, Berszán finds another basic material of industry, black silicone that has become the “trademark” of the works of art of the Genesis Project. Plastic was already discovered by modern art, but contemporary fine art it is becoming more and more fashionable. For instance, silicone is used by the young Russian artist Dmitry Kawarga silicone. In his case, however, silicone is definitive as a light material of excellent qualities which is easy to form in special ways and makes the creation of some really peculiar statues possible. What is more, because of its lightness, silicone enables the installations to hang in the air with almost invisible wires and strings. Kawarga’s floating three-dimensional shapes that are made of layers of silicone bands appear as if the mass of paint pressed out of the tube a moment ago had stopped and solidified in mid-air, defying gravity. [9. 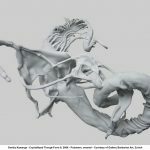 Dmitry Kawarga: Cristallyzed Tought-Form 9, 2008] These objects, carrying the gesture of creating and becoming, resemble various things like human organs or constructs that combine organic and mechanic forms. Kawarga uses light-color silicone, which gives off an absolutely different effect from the black one. It does not glisten with reflected light, and it seems a much rawer material—as opposed to Berszán’s base material. Looking at black silicone, one is easily reminded of coal, which is black and shiny, but, on the other hand, one cannot forget the fact that scientists consider silicon, the base material of silicone, as an alternative material to carbon-based life. 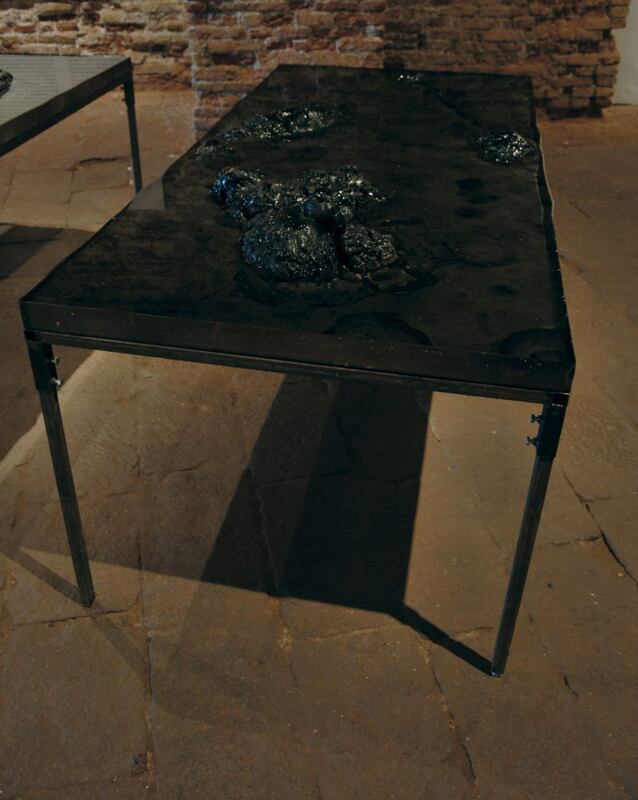 Thus, the gesture of including silicone already hints at the possibility of an “alternative creation.” By associating blackness with silicon/silicone, Berszán does not simply start applying a new material of remarkable artistic qualities, but also lays the foundation-stone of another genesis, of the rewriting of the origin of creation. Because of the existing associative link in one’s mind, black silicone carries this surplus potential of meaning even if we know very little of the biochemical background of the theory of silicon-based life. To this kind of meaningful use of silicone Berszán also adds, apart from black, the mythology of the worm, the idea of the essential role of this organism in the cycles of life which forms the main narrative of the Genesis Project. Worms and maggots evoke horror in the human being, who knows that these disgusting parasites will eventually destroy him: they do not only chew on living beings but they also eat away the organic materials of the dead body, leaving nothing of the human body to be remembered. The human being, made of earth in the mythic origins, now returns to earth and disappears there: his materiality and physically graspable existence is turned into nothing at all. This is why the worm is the object of horror for us: we are appalled at its sight. But if one turns this picture around and starts inspecting the situation from the point of view of the worm, we have to realize that the human being is nothing for the worm-maggot, he is just a transition, a momentary form of material, an illusion. As Edgar Allan Poe has put it in The Conqueror Worm, “…the play is the tragedy, ‘Man’ / And its hero is the Conqueror Worm.” Yes, the worm is victorious because in a way it stands above matter. It accepts and therefore conquers materiality. Human beings never stop fighting against their physicality and corporeality, ever trying to flee from having to acknowledge impermanence, entertaining hopes of an afterlife, but all in vain. Man’s hope for a life beyond this one remains unfounded; he simply has no other certainty in front of his eyes than the horror of mortality. The blackness of the earth in which thousands of worms and maggots are feasting will sooner or later engulf him. There is no escape. As opposed to humans, the worm plays an active part in the infinite cycle of life: it is able to turn lifeless material into new material. It is capable of something that we aren’t: it can dive into the depths of matter, into its darkness, and is able to exist in the pitch-black world of impermanence. Berszán’s Genesis Project also shows the other side of this transformative activity of the worm: not only death (from the perspective of the human being) but also the way death gives way to life. With the help of these works of art one leaves the macrocosm of humans and enters the microcosm of the worm, where one may witness the creative forces of decay and stare in wonderment at the amazing circularity of transformation and regeneration. But it is not only the thought and motif of the worm that gives the Genesis Project its force. This force is also present in all the details and minute “particles” of the exhibited pieces: in the weight and pressure of the concrete works on the walls, in the tension of the wires attached to the beams of the ceiling and to the walls, in the monumental size of the worm installation, this body turned inside out, built for the exhibition, in the inward pull of the black cavity. The dark world of the other genesis weighs heavily upon us, both making us insecure and sucking us in. When we enter this world, in which the repository of genesis is the worm, we not only step into the microworld of another creature, but also into another “universe.” Into another creation, another order, another life—a life that the human being does not belong to. The Genesis Project includes about thirty pieces arranged in three separate spaces that represent three different qualities. One goes through a narrowing corridor that leads to the hall that contains “troughpieces” using water and laid on the floor, panel paintings hanging on the walls, and monumental pieces of art hanging in the air. In the “crypt room” next to the entrance one may see three open aluminum boxes that resemble coffins. In these coffins hanging in nothingness one may witness the various states of transformation of the human body after death. From the other end of the hall (dominated by the atmosphere of the sacred) one may enter into another installation that looks like the inverse of the other exhibited pieces: a piece of art turned inside out. 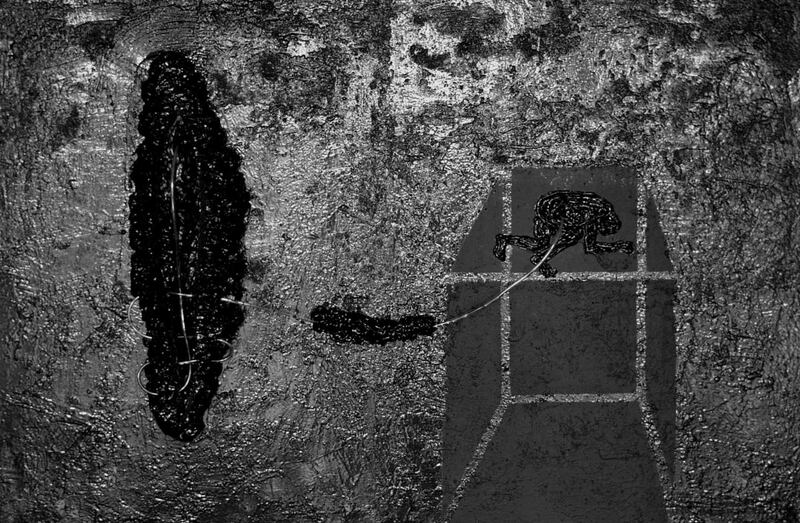 This reversed work still depicts the worm similarly to the other pieces, but here the worm is no longer only a motif, a shape, or a symbol, but rather a much heavier presence, a virtual reality that surrounds and weighs on us: the organic, physical body of a creature from a perspective that we never seen it from—from the inside. There is an unknown world awaiting us in this hollow. When one walks through the halls of the Genesis Project, one has to walk the way that leads from the corpse of a dead man to the radically alien universe of the worm. But what happens between the two endpoints? Let us try to recall the tour (reliving the art experience in the imagination) so that we may walk the aesthetic path from the decay of the human to the genesis beyond the human, as offered by the exhibition. When one enters the hall, one immediately comes face to face with “the” worm. [10. Untitled, 2008-2009] What creates this easily recognizable shape is a groove down the middle of a double metal plate which is hanging in the air. There is another worm-body protruding from the groove, made from foam and black silicone. The space between the worm-body and its groove is filled with transparent silicone but there is a web of thin black lines running over this transparent surface: as if the body of this wrinkled and pitted being had broken out of itself, growing all sorts of tentacles or smaller worms, tiny larvae in all directions, thus trying to expand its universe. Therefore, entering the hall we do not see only one worm but many, which are growing wild and multiplying in front of our eyes. The wavy black bands of silicone had transubstantiated into worms even before they were organized into the composition. These bands would transform into worms and maggots in front of our eyes involuntarily if they were not meant to evoke worm-bodies: they have become tiny, twisting, and bundled organic beings that connect, meet, and create layers and knots, worm-knots of the universe. We may see another worm on the other side of this metallic plate, but the shape is different—it must be a mutant. This large, heavy, two-sided work is hung on wires in front of us, lifted to our eyesight, concealing the view of the rest of the hall. When we are approaching through the narrowing corridor, it may seem as if we were coming towards a huge mirror. Yet what we see in the mirror is not ourselves, but the disgusting body of “the Conquering Worm,” from which smaller larvae are excreted. There is no other choice: the worm is looking at us from a black frame, and we have to look back at it. As opposed to this, in the smaller hall we find airy objects hanging from the ceiling, this entire space is characterized by the feeling of being beyond the physical, the illusion of lightness. [11. 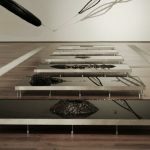 Untitled, 2009] There are open coffins hanging in the air on transparent fishing-lines silicone with horizontally stretched out bodies in them. 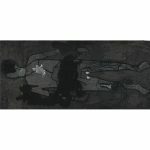 It seems as if there were a human being floating in the first one—thin, stretched out, made from black silicone bands. A man who is almost without a body: it is gone, it has disappeared, there is hardly any more flesh on the bones stretched out into emptiness. In the next coffin the streak of the body—stretched beyond the physical—suddenly opens up as if it were expanded in space: in the place of the human figure we find the visual sign of DNA, the double helix. Lo and behold, only this was left of the human being having been decomposed by worms in the underground life, nothing else but this sign, which nevertheless still carries the most important information, the genetic code responsible for transmitting “biological information” from one generation to the other. In the third coffin we can witness the first, alien shape belong to the other world of unknown materials: the “capsule.” The “capsule” is a symmetrical aluminum cylinder which, because of its symmetrical shape, seems like an object carrying artificial life. 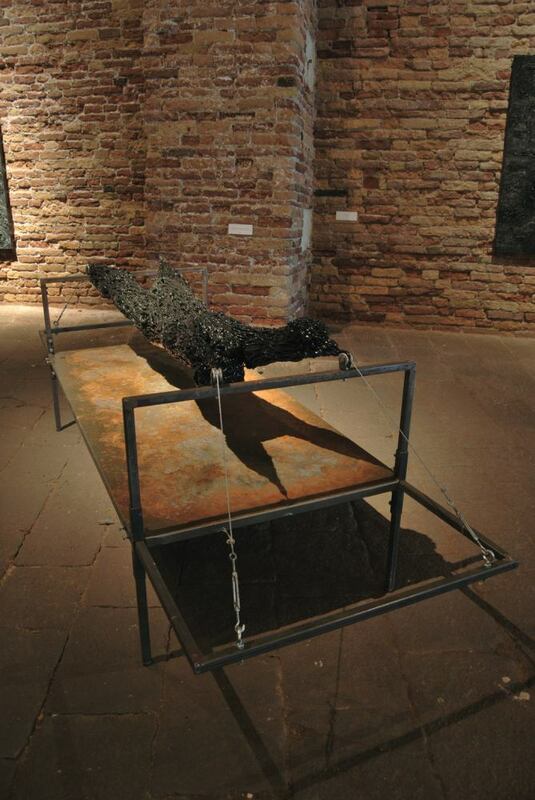 The dead body in the first coffin is made from silicone, the aluminum parts of the body in the second one are still covered by the black material with its tattered edges, but in the third coffin the only thing that we find is a silver-colored metallic object with shiny, polished surfaces. It is only when we go nearer that we realize that the metallic, ore-like material is open, split into two, and from the wound black (silicone) larvae are creeping out. Life, which ends with the dead body, continues on the other side of the material, beyond darkness and emptiness. In the middle axis of this hall surrounded by the atmosphere of the sacred one can see another series telling the story of the other genesis. [12. Untitled, 2009] These are the six “trough-works.” These also lead us from the various organic forms of the worm to artificial ones, at least to closed forms that are alien to the life that we know. Here, too, the capsule-body cracks and life, previously enclosed in the depth of matter, in the “core,” is escaping, feeling around with tentacles, representing the energy set free by decay. Nevertheless, the water present in these works may change their interpretation. Water becomes a raw material of rich connotations and possibilities, not only because of its associative connections with organic life but also because of the effects of reflection and mirroring that its surface is capable of. The black surface of water reflects light which comes back from its surface as if it were coming straight from blackness itself—from the other side of the material; from the beyond, where the limited nature of the material world is not defined as the opposite of a spiritual one, or as a degrading darkness representing matter collapsing into itself, but stands for the transcendental possibilities inherent in the color black. The trough-works are surrounded by pictures hanging on the walls: works on boards of different materials, which represent different qualities. [13. Untitled, 2009] The plexiglass gives the impression of lightness and ease, the aluminum boards that of coldness and beauty, [14. 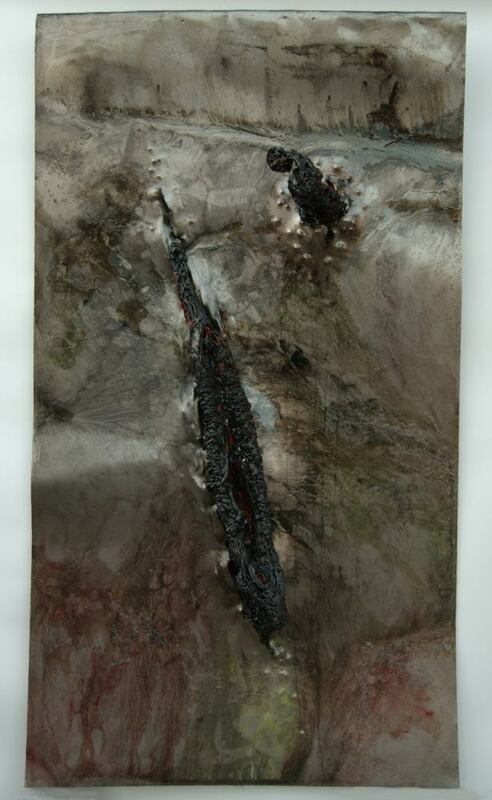 Untitled, 2009] while the concrete has the aura of a robust, coarse, and powerful material. [15. 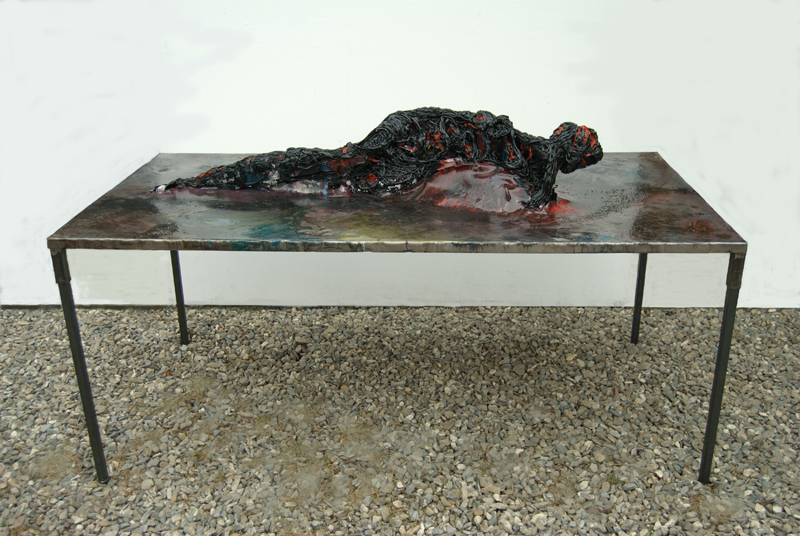 Untitled 2009] On the two boards made of concrete one can see human figures, not bodies of maggots or worms. But these human bodies resemble pupa or larvae, representing a transition between the two worlds. The surfaces look much less worked out, much rawer near the axis of these figures, creating a stronger spatial expressiveness. In this middle streak Berszán has replaced the foam with hand-molded concrete, the unrefined shaping of which imitates the twisting and meandering of the bowels. 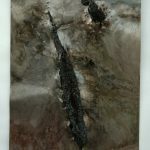 This raw surface and generally speaking the crude representation of the human form express the connection with materiality even stronger. Thus, Berszán does not exclude the idea of the human being from the world of the Genesis Project. This faceless universe of the worm is thus not without humans—it is just inhuman. Because it is not meant for the human being. This universe is kept together by a different telos: it is not structured by the self-determined life of the spirit but by the transformation of matter, which follows its own rules and has its own order and organic structure. This organic structure that is so unfamiliar to us becomes most horrifying in the locally specific installation that Berszán has created for this exhibition. [16. 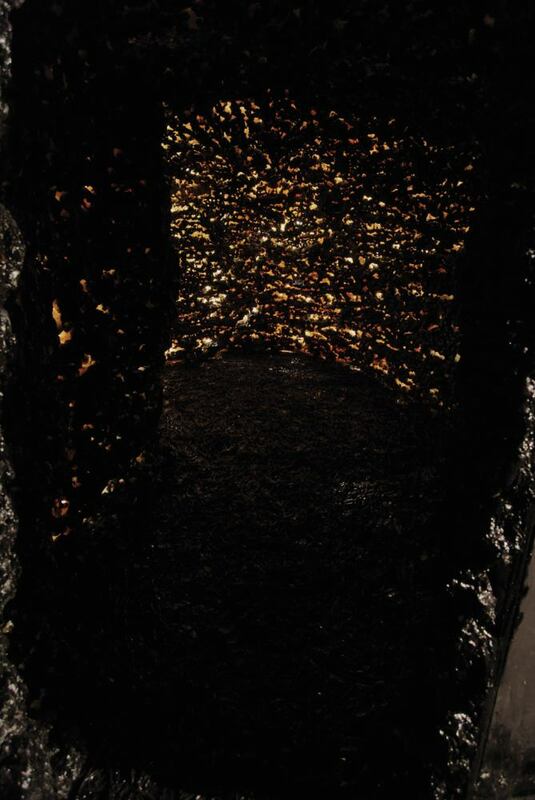 Untitled, 2010] The monumental work made of wood, wires, polyurethane foam, and silicone keeps inviting the hesitant visitor to enter like a huge black cave. 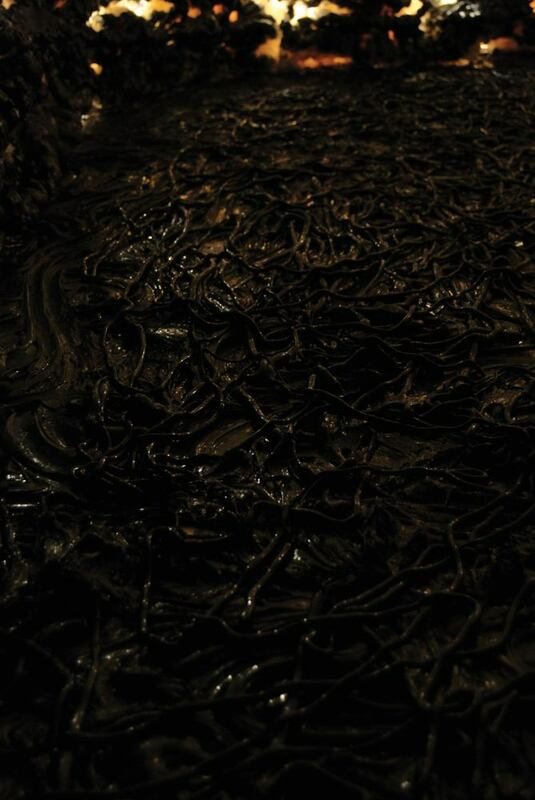 The floor is also made of a shiny black material that gives the impression of being slippery and slimy so the visitor easily gets a little unsteady and uncertain. We cannot possibly know what is waiting for us within the body of the worm. Once we are inside suddenly another world opens up before our eyes, one of smaller organisms, other parasites: viruses, bacteria, and larvae hanging on the walls. A frightening world in spite of the strong light, because it is not dark inside. Yet blackness, which is no longer locked up in the frame that separates the fictive world of the work from the homely world of the spectator, is all over us, dripping and leaking on us from everywhere (the ceiling, the worm-body, even the floor). We feel it is swallowing us. The unfamiliarity of this space causes anxiety. Then we notice the little openings on the side of the alien body, the cuts that appear like wounds of the porous worm skin. 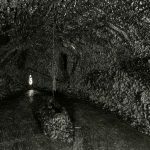 Then we know that it is not a cave that we have entered. Because there is light coming through the openings. So there is a world outside as well, even though we do not know what kind exactly. Maybe these are cracks that the small larvae use when they are breaking out to conquer and eat the up whole world. Maybe the entire worm-body will soon explode and the darkness will cover everything, paint all over so there will be no other world any more. There will be nothing left of my home “outside” that I thought was so safe and strong. Here within this frightening space, my former knowledge about the world suddenly becomes illusory and fictive, something that loses ground when I enter the heart of darkness. 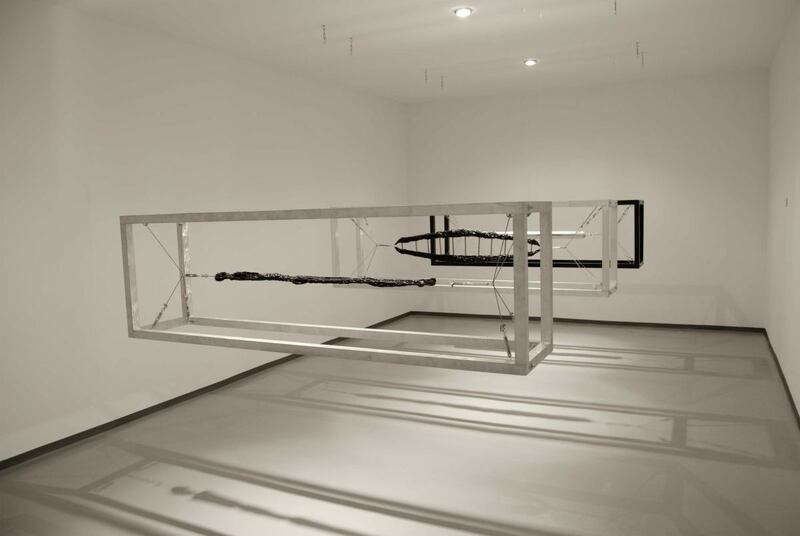 It is here in this installation that Berszán’s view of black becomes complete. 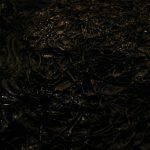 The walls of the maggot body are black as the night and beautiful. Its structure of organic patterns resembles an extraordinarily beautiful material ornamented with pearls and amazes us. Its structure reminds one of Damien Hirst’s triptych entitled Forgive Me My Sins, My Father! 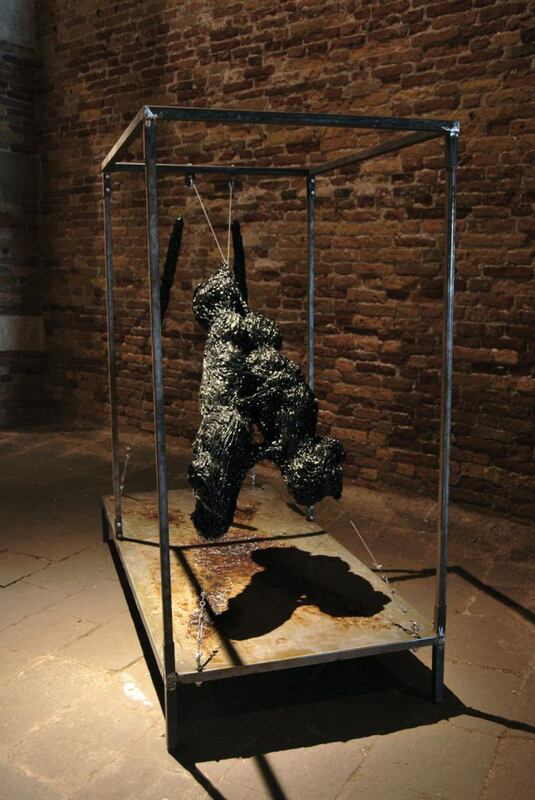 (2006), which represents the problems of sin, forgiveness, and faith in three separate but connected pieces. 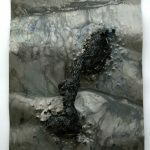 Its bulging, waving surface is made from garbage painted black in oil paint (similarly to Rauschenberg’s method in his black series). The poor quality of the materials used and the glittering surface create an ambiguous interpretation of the sacred, but it is this very ambiguity that enables transcendence to appear simultaneously as a radical difference and as the proximity of the sacred. The works of art of the Genesis Project enable one to experience the same depth of the opening up of transcendence. Blackness here also opens up to an infinite profundity. Neither to the spiritual profundity of a human being conceptualized as a metaphysical being nor to the infinite horizon of another world: we are still on this side of our material world. The light that we perceive is coming from the depth of darkness, from beyond matter, where there is organic life, where there are newer and newer beginnings: the will of life to life, hatching from itself. 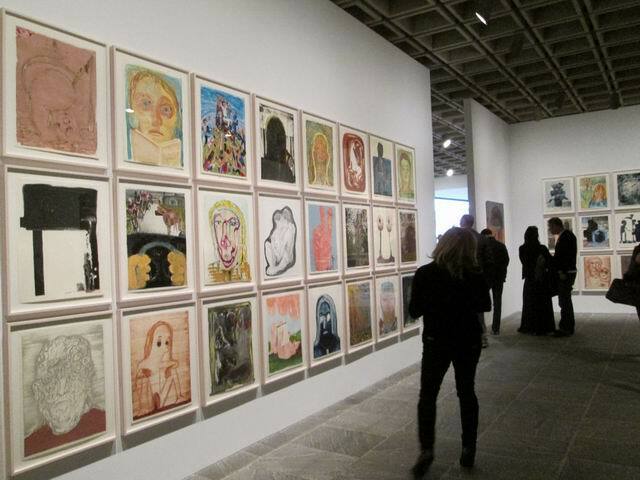 Let us again take an imaginary tour of the exhibition. 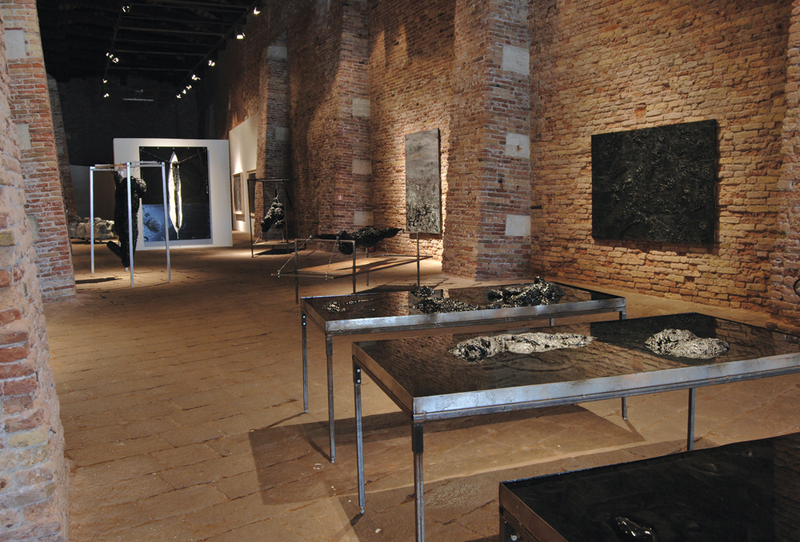 The two series (the two different exhibitions) are connected through the common ground of black. 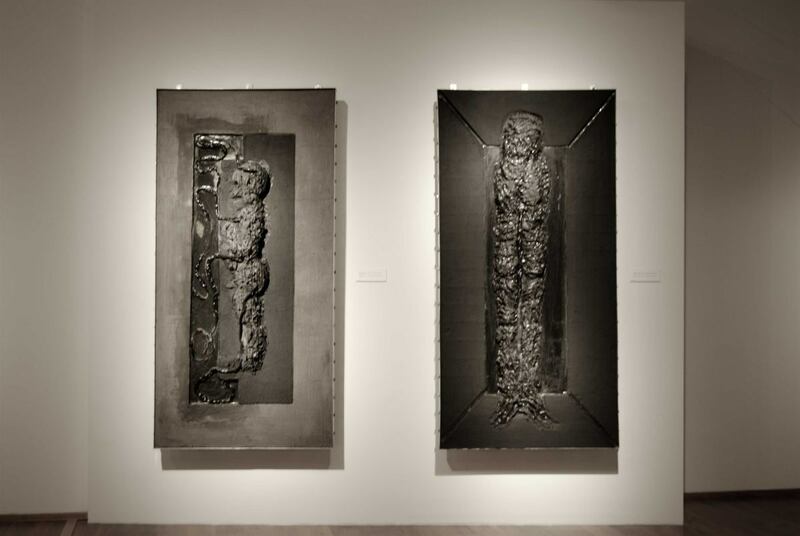 Here, too, each work of art is black: the paintings, the drawings, the statues of concrete, metal, and silicone. 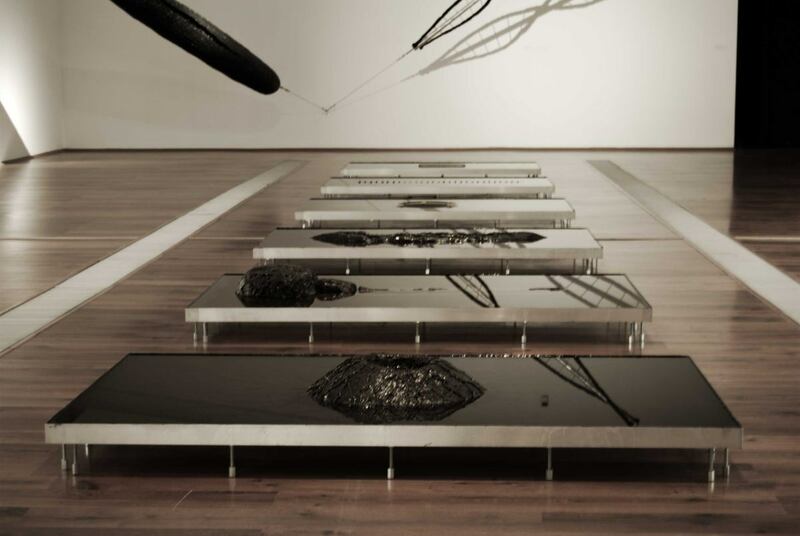 Moreover, transparent water—which appears as an autonomous base material of art—is black here. Water, which is generally a motif symbolizing life, here evokes the idea of death. The force of the exhibition, however, is not merely a result of the resigned acknowledgement of the fear of passing, but of the way meanings of transcendence are added to the desacralized phenomenon of the decaying human body. It is hardly disputable that the human body after death does not remain an integral whole, it is not spiritualized and not assumed like the bodies of Christ and the Virgin Mary (at least according to the Christian theory of ascension), but it ceases to be. The body, which was the human being’s most personal belonging on earth, the “thing” that they could most identify with during their earthly life, is not redeemed: after death it is decomposed into its components and it decays. For the creature in existence, who is defined by his or her life instinct, this is the greatest despair; for the human being, who is imbued with a consciousness, this is the greatest trauma. Knowing that earthly life is finite, however, is a trial not only for the individual, but also for humanity at large, since history is but a collection of parables of decay: stories of wars, murders, and bodily death. 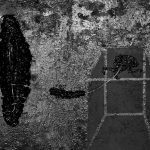 Berszán’s drawings—the swirling pencil lines which first appear shapeless and devoid of any narrative, which walk the broad interval between grayness and blackness, between line-structure and homogeneous surfaces—reveal the “cemeteries” of death camps: mounds of decaying and dismembered bodies deprived of their souls. 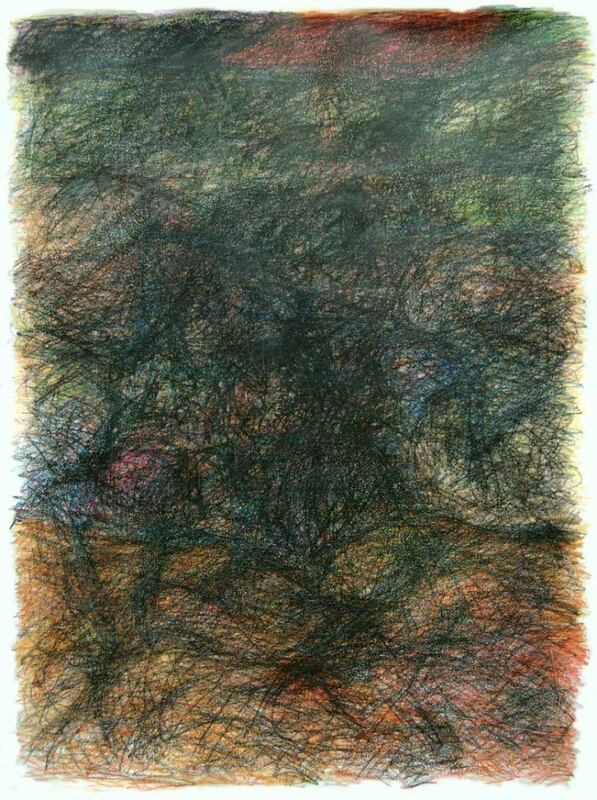 In these drawings, indeed we do not see bodies, but only objects, simple residue without any meaning. Berszán’s 2016 exhibition in Berlin, Dissecting the Unknown, also featured the works made after 2010 which initiated their viewers into being eyewitnesses of death, unfolding the other horizon of transcendence: this time not on this side of matter, but in the beyond. 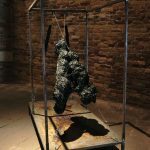 By making visible the decomposition of human materiality these pieces point to the ultimate question that the human being is able to formulate for his- or herself. The final question which could only appropriately be posed by a final eyewitness: is there anything left of the human being when the body ceases to be? 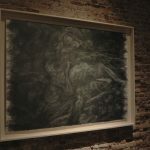 Berszán was probably the first in Central and Eastern European art to thematize the “post-human condition” as an experience which is of fundamental importance to our existence — by today this subject matter has become popular not only in Hungarian and Romanian fine art but also in the entire region. 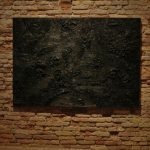 Berszán’s approach, however, remains to be progressive and genuine: he becomes a unique personality of post-human painting and sculpture because he attempts to represent the post-human quality exclusively through the color black. 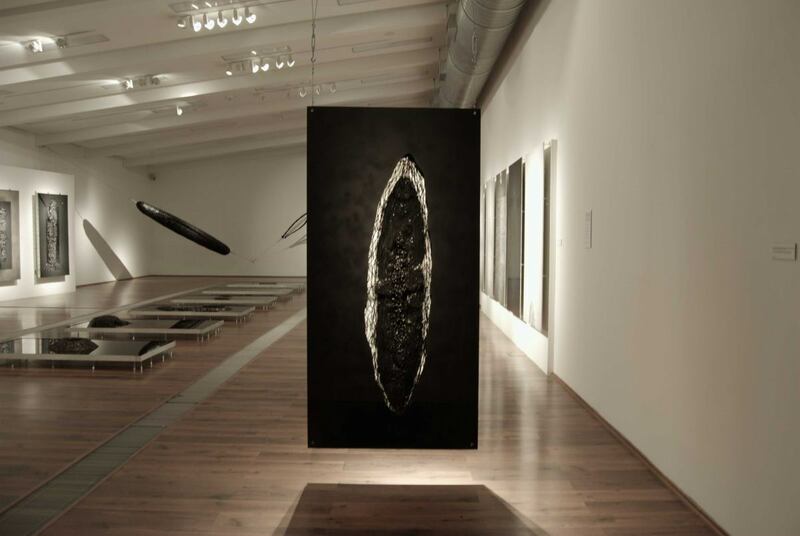 Since 2005, the birth of the first black works, he has gradually been furthering the exploration of this quality, simultaneously pointing out the endpoint of human culture, the limits of the human body (decay and the processes of transformation), and the non-human perspectives of existence. He is currently intrigued by the question whether this primary color of finitude and the beyond holds other qualities and hues. Can blackness be any blacker? The process of wounding the color black was commenced with the appearance of the color gray. As opposed to black, the color gray, naturally, represents another quality, but set, as we have seen, in this artistic universe it cannot be regarded as an autonomous color, in the way we can see it in Gerhard Richter’s works, for instance. For Berszán gray remains to be a hue of blackness. 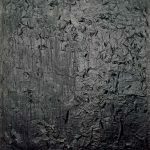 Initially this tone was only represented by metal plates with their natural surfaces, which served as a medium for the color black; later “metallic gray” was included in the compositions as a painted (that is, abstracted) color; while starting with objects in 2016 it was transferred to a radically new field of meaning. In these objects the metal plate is not a simple carrier surface any longer, but it is the gray material that allows the “real” color hiding underneath, black, to break through. 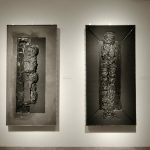 The metal plates of the untitled objects are worked roughly by the artist: he damages, scratches, slashes the materials with various pointed tools, hitting and cutting implements, as a result of which real wounds protrude from the formerly flat surfaces. [29. Untitled, 2016] This rough molding—which is connected to the idea of “energy and momentum” discussed earlier—is parallel to the efforts of informel painting, where, on the one hand, tools alien to the process of creation are involved in it, on the other hand, these tools tear open the surface of the canvas. 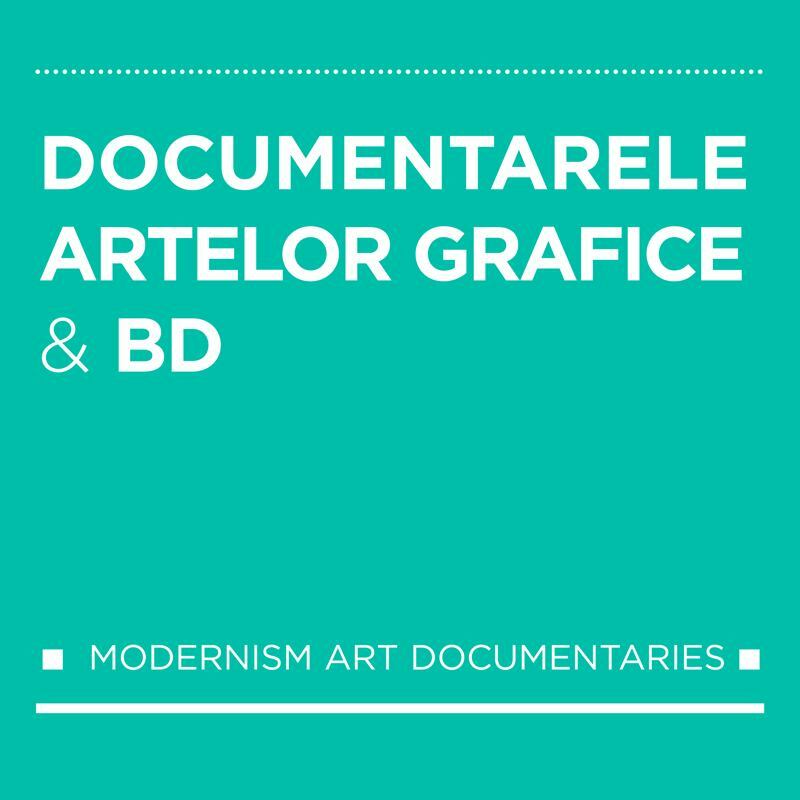 Berszán represents the same kind of artistic gesture, but in his case the meaning of acts involving physical force goes beyond aesthetics and gains ontological meaning. The Cluj-Napoca artist pummels and cleaves the metal plate until a wound appears. And it is only where a real fissure opens up, where the material splits, can the silicone forms of blackness break out, finding a way and a shape for themselves. The bands of silicone emerging from the wound and winding together cannot remain in the plane of the two-dimensional metal plate but—starting out from Clement Greenberg’s idea of painterly flatness—create a sculptural surface, that is, a spatial object. Translating all of this into the metalanguage of painting, this means that the smooth surface of the material serving as medium does not “lend a place” for the paint to be applied, so that an “innocent world”—symbolically placed motifs, colors, and shapes—emerge. On the contrary. [30. Untitled, 2016] As opposed to the idea of a “meek creation,” an act of transgression is carried out here via the act of aggressive creation: the surface of the material must be split because it is only through the wounding that it can open up to itself, that is, its own depth. From the depth of the material bursts forth the material’s black soul, or, if you will, its black blood. Berszán’s miniatures, created after 2016, also carry the traces of wounding. Often these works cannot even be interpreted as shapes that aspire to an autonomous meaning. The intertwined bands of silicone yielding the structure of the sculptures oftentimes look as if they were mere blow-ups of black blobs of paint. At other times we are inclined to discover human figures in the statues, but the figures only barely remind us of any human formality; via their distortions they leads us into the realm of the post-human and inhuman. 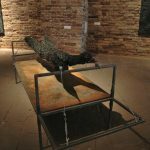 One of the most important, and one of the largest, pieces of the series features a semi-anthropomorphic, somewhat wormlike creature which crawls along on its belly on the metal table which has been worked both in a physical and a painterly way. [31. Untitled, 2016] Aesthetically we may interpret the lump of bare paint emerging from the cleft in the two-dimensional surface as blackness itself. 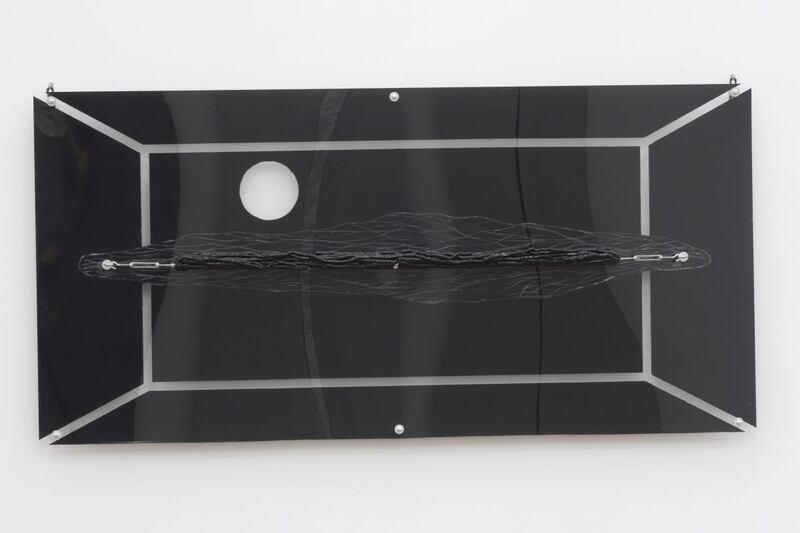 Berszán goes further, carrying on with the gesture of wounding after breaking through the surface, continuing in this “black body,” now also wounding the black paint and the black silicone. The red clogs of paint appearing in the fissures among the bands of silicone look as if blood were flowing from real bodily wounds. The color red as a separate color does not become an autonomous “quality of the world,” does not serve as an opposition to black, but the other way around: red lends itself to perception as the flesh of the black body. The same observation could be made about the 2017 chalk and pencil drawings, which are not compositions organized from autonomous colors: the colors are the different hues of blackness. 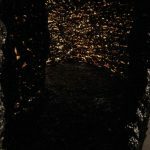 The greens, purples, pinks, and oranges glimmer through the tightly woven black net, making visible the depth of wounded blackness through the opening crevices. [31. 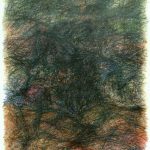 Untitled, 2016] Here, too, the sensitive surfaces woven from webs of lines hint at the darkened world, recalling the thematics of the Shoah and other massacres, just like in the drawings from 2014, the only difference being that colorful tones appear hazily here. However, these tones do not promise to get over the trauma, they do not become counterpoints to the horror of history, but refer to darkness, which encompasses and consumes all. To rephrase: the black network here is not a veil covering a beautiful and harmonious world and the ease of everyday life, which simply needs to be lifted. No: black entraps, encloses, and makes impossible all qualities that are tied to carefree existence and forgetting. Through the colors, therefore, we receive a more radical questioning of rebirth after the Shoah; the motif of the black net is transfigured into a symbol of the irresolvable trauma, which leaves behind the values of humanism. The captured hues revealed under “the shroud of darkness,” which whirl without reason and meaning, refer to hopelessness and aporia. The colors do not dissolve the black but make it even blacker. In Berszán’s works this immaterial whiteness does not exist, or more precisely, matter fills all with its thickness, finitude, and darkness. 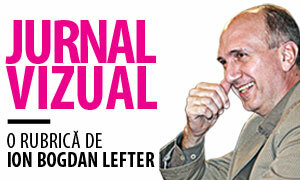 For Berszán the color black is the place which swallows up the universe like a black hole. When the artists wounds the color black, defined as a totality, he does not reduce the world to one of the primary colors, but rather opens it up, expands it, makes possible the autistic movement of self-reflection. And what the viewer may glimpse there in the depths of blackness, in the glow of colors, is not the promise of dissolution but the certainty of an ever greater darkness. The meaning of blackness in Berszán’s case is closer to Adorno’s definition than to the Malevichian ideal: while it does not entail the impoverishment of means, colors are lost within it and fixity disappears from its background. Whatever can emerge and unfold from it despite all, whatever becomes a visible, sensible, or tactile quality, also withdraws into the darkness, poised on the edge of silence. Theodor W. Adorno: Aesthetic Theory. Trans. Robert Hullot-Kentor. Ed. Gretel Adorno and Rolf Tiedemann (New York: Continuum, 2004) 50. Berszán, Genesis Project, MODEM, 11March – 20 June 2010. Curator: Gerda Széplaky. 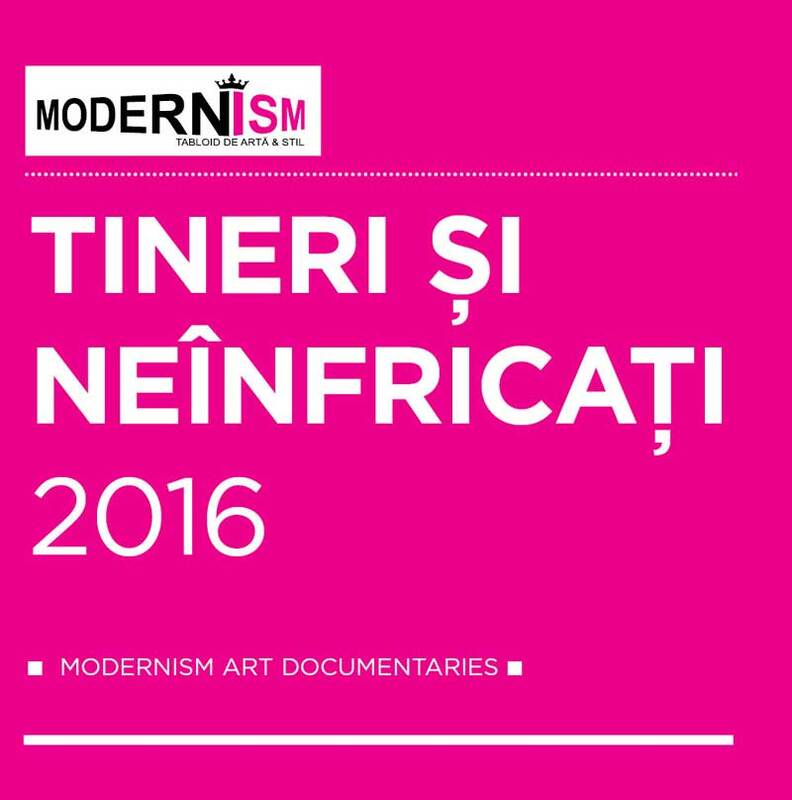 The reproductions of the works of art can be viewed in the exhibition’s follow-up album Berszán, Genesis Project (ed. Gerda Széplaky). MODEM, Debrecen, 2010. Black Painting. Haus der Kunst, München, 15 September 2006 – 14 January 2007. Curator: Stephanie Rosenthal. The exhibition was accompanied by an exacting album, with Rosenthal’s introductory essay. Gerhard Richter, Eight Grays. Deutsche Guggenheim, Berlin, 2002–2003. Back to Black. Bild-Kunst, Bonn, 2008. Curators: Eveline Bernasconi, Caroline Kading, and Frank-Thorsten Moll. Berszán, Decomposition. Venice, Italy, 6 June – 6 July 2014. Curator: Gerda Széplaky. Zsolt Berszán, OBJET, Bázis Galéria, Cluj, Romania, 24 February – 28 April 2012. Cf. Julia Kristeva, Powers of Horror. An Essay on Abjection. (Translated by Leon S. Roudirez), Columbia University Press, New York, 1982. Anaid Art Gallery, Berlin, 2016. 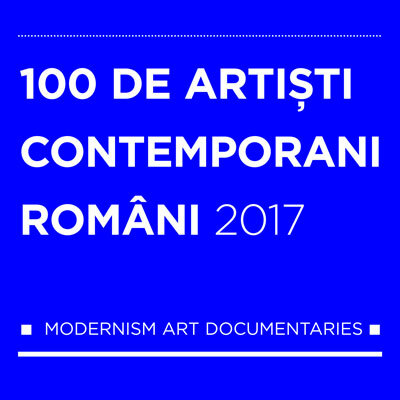 Curator: Diana Dochia. Malevich: Suprematism. In: Robert L. Herbert (ed. ): Modern Artists On Art. Ten Unabridged Essays, Prentice-Hall, Inc., Englewood Cliffs, New Jersey, 1964. 94.